In June, 16 year old Ethan Couch and his friends were caught on camera at a local Wal-Mart stealing beer. Unfortunately, it was only after a drunken joy ride that claimed the lives of four people that anyone saw the surveillance video. That drunken joy ride ended with Ethan Couch having a 0.24 BAC, four dead and two seriously injured. Breanna Mitchell, 24, was having car troubles and pulled to the side of the road. Hollie Boyels and her daughter Shelby, 21, lived near by so they came out to try to help Breanna. Brian Jennings, a youth pastor, saw the group and decided to stop by and lend a hand as well. Shortly there after, Ethan Couch lost control of his parents Ford pick up truck and slammed into Breanna, Hollie, Shelby and Brian while going 70 mph in a 40 mph zone. All four victims were killed. In addition to the four on the side of the road that lost their lives, two of the seven (SEVEN?!) in Couch’s pick up truck were thrown from the vehicle and were seriously injured with one not being able to move or talk. Test concluded that Ethan Couch was three times (0.24) over the legal limit (0.08). A legal limit set for those over 21. His legal limit? 0.00. So technically, he was 24 times over the legal limit. The prosecution, and families of the victims, were seeking a 20 year prison sentence for his crimes while the defense had something else in mind. 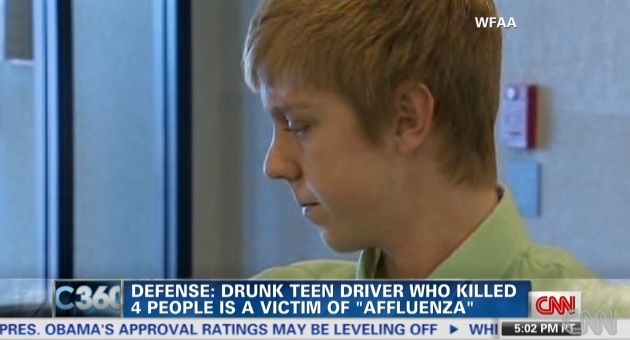 Ethan Couch comes from a very wealthy family in Texas and, according to a psychologist for his defense, he suffers from “affluenza”. This is described as not knowing right from wrong or not knowing consequences for your actions because of the luxuries being rich has afforded you. The psychologist continued that the teen’s family felt that wealth bought privilege. You read that right. He argued that Ethan Couch’s life could be turned around with one or two years in a rehab facility where he had no contact with his parents. And the judge BOUGHT it. Ethan Couch was sentenced to 10 years probation with the first two being served at a, get this, $450,000 per year rehab facility in Newport Beach, California. He will have no contact with his parents during that time. The prosecution, though pretty rare, can challenge the sentence for being too lenient, but if there were ever a time to issue that challenge it would be now. 1.) What the exactly is he going to rehab for? Is there a rehab facility in this country that helps people get over being a snobby rich kid? Because if there was, I’m sure there is a wait list. In all seriousness though, it is as if this judge slapped Ethan Couch on the hand and grounded him for two years. I had to check multiple sources on this story because I thought I was being punked. 2.) Why aren’t his parents being punished? It is clear that the defense is putting the blame on his parents for what their child did. The upbringing he had, according to the defense, rendered Ethan unable to know if he was doing something wrong because he never got punished for anything. Someone has to pay for this crime. 2.) What does this sentence, if you can call it that, actually accomplish? It gives absolutely no justice to any of the victims or their families. It paints a clear picture for the Couch’s that their money, once again, has provided them privilege. 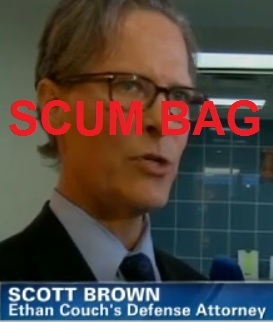 And for the obviously corrupted 16 year old murderer, he is on his way to California for an extended stay at a half million dollar a year facility. Ethan Couch has not, and will not, learn his actions have consequences until someone cuts his cord. Quit making us look like jerks, Texas. Yikes. I knew a guy who went to jail for 2 years for stealing an $18 perfume set for his girlfriend from Wal-Mart after being fired from the store. They prosecuted him to the fullest extent. So in handing down this sentence, the judge affirmed that being rich CAN in fact, buy you anything, even your freedom. Good job, America. I’m going to make sure I get super rich before I commit any crimes.